Italian painter and draughtsman, originally Polidoro Caldara. His surname, Caravaggio, came from his birthplace. He moved from Lombardy to Rome around 1515 and soon joined Raphael s workshop, which was then occupied with the frescoes in the Vatican Palace. A student of Raphael, he was responsible for some of the monochrome decorations in the Vatican Stanze as well as for the Loggetta of Cardinal Bernardo Bibbiena. In 1517-18 he began working with Giulio Romano and Perino del Vaga on the frescoes in the Vatican Logge of Leo X, where he can be credited with the scenes of Joseph Sold by his Brothers and the Crossing of the Jordan. He formed a close friendship with Perino and with the Spanish painter Pedro Machuca, who was also working on the Logge. Between 1524 and 1527, Polidoro became renowned for his monochrome re-creations of Roman history that spanned palace facades. He decorated the exterior of many Roman palaces in sgraffito, a form of painting where, over a dark background, often stucco, a lighter-coloured layer was painted, and designs, scratched through the light layer, only showed dark on light. These designs are known today only from reproductive etchings and engravings. When Charles V s armies sacked Rome in 1527, Polidoro fled the city, traveling to Naples, where he had escaped Rome s plague in 1524. In Messina by 1528, far from Italy s artistic centers, Polidoro settled upon a strong, consistent style from which he deviated little. Using lively, loose brushwork, he painted mainly religious scenes infused with a sense of drama and intense emotion. A prolific draftsman, Polidoro drew in preparation for paintings and for its own sake. His drawings express inventive fantasy and real experience with force and emotion. Tradition has it that his servant murdered Polidoro for his money. 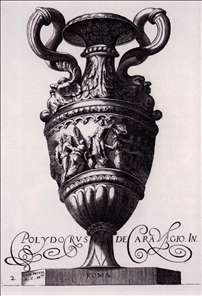 See more details about "Design for a Vase"